A disproportionate number of homeless youth identify as LGBT. They are more likely to be robbed, harassed or assaulted than straight homeless. In cases of family rejection, they often have nowhere to go. Vanessa is one of these youth. 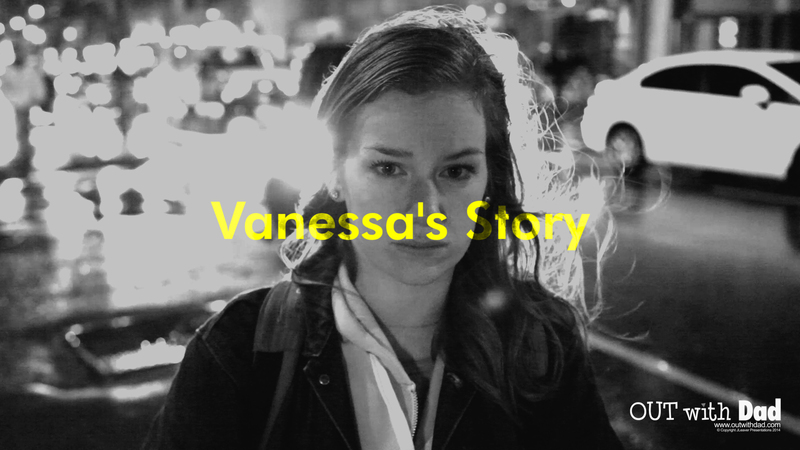 Vanessa’s Story is a new web series that we created in secret while filming the rest of Out With Dad. In the last moments of Out with (Song and) Dance, we saw Vanessa leaving home – but to where? In this dark and gritty spin-off series, running parallel to the story of Out With Dad, Vanessa’s Story tells of the harsh reality in store for many teens when they aren’t accepted by their families because they came out. For Vanessa, being true to herself means leaving home for the uncertainty and the danger of the streets of Toronto. We do not know the exact dates, but we’re hoping to have all episodes from block 3.2 ready to launch for the beginning of March. Episodes of Vanessa’s Story will be mixed in with episodes of Out With Dad. When we know the exact dates, they’ll be posted on our /whenisthenextepisode page. This is a request to acquire a photo from the series “Out with Dad” and “Vanessa’s Story” for a book called “Internet Gay and Lesbian Television Series.” If you can do so, please respond at the e-mail address given for further information. Hopefully, this will be parents watching, and being supportive with their children by watching this… than kids and young that watch this, and start to fear coming out… as they might get rejected or thrown out by parents. According to this trailer, it seems Vanessa’s parents are still going to play a part of the story, witch is good. Then we can see their reactions toward Vanessa being out on the street. It will probably be very tough to watch, and probably very hard role to play. If that was sexual assault on the trailer, I’m more than sure I wont like to watch Vanessa’s story. I cant. I just cant. Wow… this looks like is going to be an awesome show. With Out with dad focusing on a girl with support, this one focus on one without support. A kind of worst case scenario. What might be the result of rejection. I think people seeing a worst case scenario will also help people understand what might happen if you push your kids away. It would also be nice to know more about Vanessa. She haven’t even talked about her sexuality or anything. She seemed like she was just trying to figure out herself. Maybe we also find out what happened to her brother, that is talked about earlier. Someone their parents lost earlier. We never get if he died or also was rejected from the family of the same reason. Lindsey Middleton is such an amazing actress, though. I will watch anything she is in! Vanessa is my favorite character. She was a lot like I was in high school. Hopefully she’ll manage to get back up, and use this all to grow and become stronger. I can’t wait… literally checking every day. I don’t know what to say. What a shock. I’m so happy to have your art. You are doing a hugely honorable work Jason. Thank you so much for your loving heart! I look forward to seeing where this goes. And kudos to everyone involved for being brave enough to tell this story. This news is so awesome I can’t believe it. Very cool. Your team continues to produce wonderful material that is both tremendously entertaining and socially important. Keep up the great work! I hope Vanessa ends up OK. How far her charater has come, starting as a girl alot of people hated into one who story rips our hearts out tap dances on it. That is just a testament to your writing and Lindsey’s acting. I love it. It is a reality and something that happens everyday. Hopefully trough all these videos people will gain some understanding on how tough it is for us to just be human. There is no need for all the hate because in the end we all bleed the same color. We are all the same and who we choose to be with shouldn’t be an issue. I love this web series and I am so glad I came across it a while back. Thank you for all your hard work. I really love the job you are doing, I don’t think you know all the impact you have, and all the light you bring to so much people. Lots of blessings to all the team. This hits so close to home and thank you for making it to shed light on what family rejection is like when coming out as LGBT and LGBT homelessness. Thank you. This is such an unexplored topic in this medium, so I applaud you and the entire cast and crew for highlighting the plight of these children. It goes without saying (but I have too, officially) that I want the spin-off on PNT Tv as well. Also your very loyal friends and fans on our site are clamoring for our interview!? Say the word! Best wishes. amazing that you’re tackling that problem as well! Thanks for bringing the reality of homeless teens into the story. I know how hard it is to be in an unnaccepting family, and really want to see more about the (sad) realities that some people face when they leave or are kicked out (as I haven’t been).. I am going to look forward to seeing both the new series of OWD and now Vanessa’s Story. It’ looks amazingly well cared for and produced. The trailer looks awesome. Look fwd. to see how the story unfolds. Thx OWD for going that extra mile to help bring awareness to issues concerning teens who are questioning not only their sexuality but their life in general.